Straight out of our nation's capitol, Jay got his ?rst big break on radio as the cohost of Baltimore's successful WXYZ morning show and was soon voted Baltimore Magazine's Comedian of the Year. After moving to Hollywood, well known from his explosive performance on HBO's 'Russell Simmons Def Comedy Jam', Phillips followed up his stand up success with performances on 'The Late Late Show', 'Jimmy Kimmel Live’, Showtime's ‘Comedy At The 420’, Live at Gotham and many other televised performances. - Jay landed a leading role opposite Will Ferrell, Woody Harrelson and Andre 3000 in the New Line feature ‘Semi-Pro’. That lead to a steady stream of Film and Television appearances keeping Jay on TV daily for the last decade.Stand Up ComedianSince Variety Magazine labeled him 'Top Comics To Watch', Jay phillips is one of the top stand up comedians headlining the country right now. Appearing on dozens of TV shows that showcase the great art of stand up, Jay has had many memorable performances. 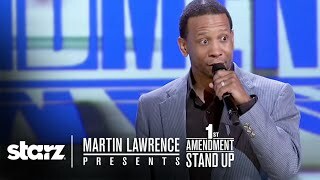 From the Showtime special Comedy At The 420, HBO Def Comedy Jam, 5 times on BET Comic View, STARZ 1st Amendment, the Late Night circuit and many more, Jay has become a well rounded and respected in the craft. Actor- Using Stand up as a springboard, the DC AREA native branched o? to become a very well rounded actor. After studying with Hollywoods top acting coaches for years, he has found himself breaking out starring in major ?lms, network television shows and national commercials. The movies Semi-Pro, Baby Mama and Prom Night all debuted #1 in the box o?ce and remain in constant rotation on cable to this day. Episodes of The Shield, 10 Things I Hate About You and The Soul man are all in current rotation. A new documentary called DYING LAUGHING is in ?lm festivals currently and has Jay featured in it, following the plight of the stand up comedian.Commercials Jay Phillips mass appeal has landed him as the face of many major brands in national commercial campaigns. He has represented McDonalds, A?ac, Kia, Lotto and many more, even having a Super Bowl commercial for Carmax in 2013. Writer/Producer Jay Phillips has lend his talents to many projects as a writer and producer. In 2014 credits included Writer/Consultant on the Critics Choice Awards ( writing for monologue and segments). NBC also hired Jay as a producer to create the pilot #Funny that is still up for possible syndication. BET hired Jay to segment produce the called THE XPERIMENT that aired daily in 2015. Currently Jay has been hired as a writer on the BOUNCE TV shows IN THE CUT and the networks number one show FAMILY TIME.